ABC News is asking Got Work? Casey Savage graduated from Trinity College in Hartford with a 3.8 grade-point average and honors. What he doesn’t have is a job. "I’ve talked to 24 different firms so far. Hedge funds, investment banks, private equity shops," Savage said. "And I just feel that there’s limited opportunities at this point." According to a survey from National Association of Colleges and Employers, the class of 2009 is leaving campus with fewer jobs in hand than their 2008 counterparts. 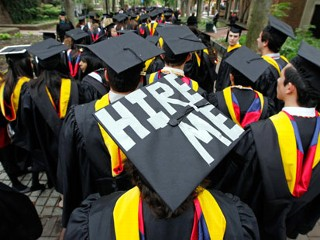 The group’s 2009 Student Survey found that just 19.7 percent of 2009 graduates who applied for a job actually have one. In comparison, 51 percent of those graduating in 2007 and 26 percent of those graduating in 2008 who had applied for a job had one in hand by the time of graduation. Kahn studied the impact of the recession in the 1980s and found that seniors who graduated then were still feeling the impact 20 years later. Today’s seniors are "going to be earning much less than their counterparts who graduated in better times and they’ll be in lower level occupations," she said. "If I were a 22-year-old today I would be willing to take an unpaid internship," said Lanna Hagge, director of Career Services at Trinity College. "I would be willing to do almost anything just to get the experience and exposure." (CBS) The nation’s unemployment rate is soaring, inching closer to 10 percent with each passing month. And that spells trouble for graduating college seniors, about to compete in the toughest job market in decades, reports CBS News correspondent Priya David. "The previous 5 years it was a seller’s market for these kids," said Ed Koc of the National Association of Colleges and Employers. "They could pretty much demand what they wanted in terms of a job and what they got from an employer. That’s no longer going to be the case."